How’s your February chugging along so far? Mine is off to a solid start, and I’m already feeling a bit more positive now that the doldrums of January are past! As for things on the OSG front, we’re working away on our rebooted Friday FAQs and Things I’m Loving Lately series, as well as a couple new ones that will be launching in the coming weeks. And, of course, plenty of delicious plant-based recipe testing is going down, too. Things are just a-bopping around here!! It’s been fun getting into a groove with regular blogging again, and I’m so thrilled you seem to be enjoying the recent posts too. I had a lot of requests to post this warm salad recipe after sharing it on Insta Stories and mentioning it in my most recent Things I’m Loving Lately roundup. Well, ask and you shall receive! I hope you love this cozy salad as much as I do. It’s a great way to use up any veggies lurking in the back of your fridge—I like to toss those on the pan to roast with a big batch of squash so I have plenty of leftovers for the next few days. The extra veggies and dressing make for a really quick reheat-and-serve lunch. If you’d like to pack this for a work- or school-day meal and still enjoy the “warm” aspect, you could store the squash separately and heat it up in the microwave before serving. Just a thought! I’d love to hear what you think if you try it out. This is a simple, warming salad that’s been on my regular lunch rotation all winter long! It’s so comforting and the vitamin A in the squash gives my skin a revitalizing pick-me-up. I’ve used butternut squash in this recipe, but feel free to use any variety of winter squash you have on hand. 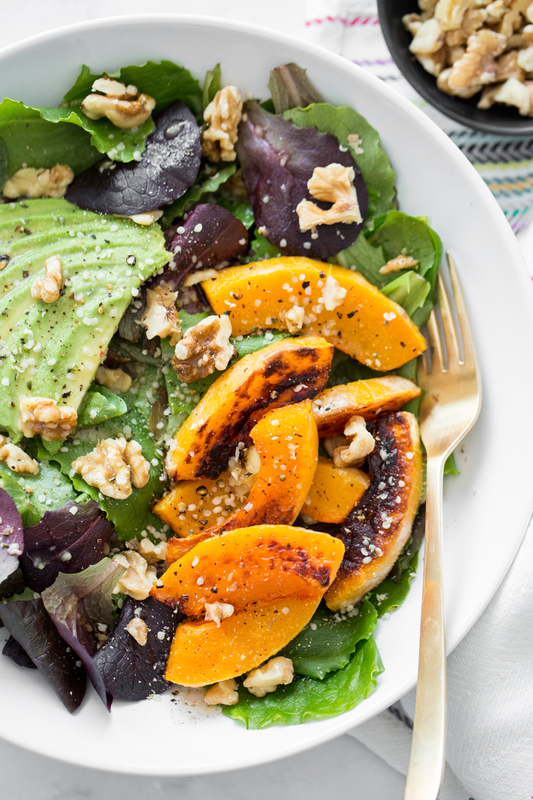 And if you’d like to throw some other veggies onto the pan while you roast the squash, be my guest—this hearty salad can be easily customized to suit your preferences and pantry! The directions are written so the recipe serves 4 people, but if you’d like to make a single serving at a time, you can find my method in the tips section below. 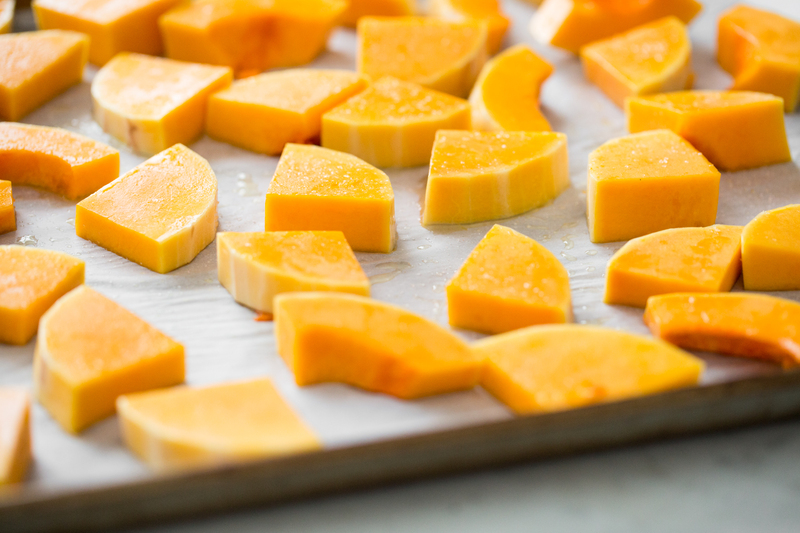 For the butternut squash: Preheat the oven to 400°F (200°C), and line a large baking sheet with parchment paper. Peel, halve, and seed the squash. Slice the squash into 1/2-inch wedges. Transfer to the baking sheet and toss with the tablespoon of oil. Spread the squash into an even layer and season generously with salt. Roast for 30 to 40 minutes, flipping once halfway through until the squash is fork tender and lightly browned. Meanwhile, prepare the Garlic-Dijon Vinaigrette: Finely grate or mince the garlic and place it into a small glass jar. Add the vinegar, oil, lemon juice, Dijon, salt, pepper, and maple syrup. Secure the lid and shake vigorously until combined. Taste the dressing and adjust the oil, salt, and maple syrup, if desired. You can also make the dressing in a blender or food processor, if you’d prefer. When the squash is nearly finished roasting, begin building your salad bowls: Portion 2 to 3 handfuls of the baby romaine/mixed greens into four large shallow bowls. Drizzle a tablespoon of dressing over each bowl and toss until the greens are fully coated. 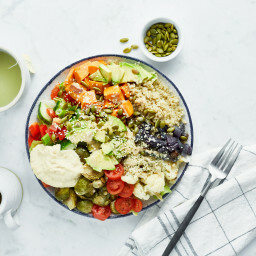 Divide the sliced avocado, walnuts, and hemp hearts into four portions, and evenly distribute on top of each bowl. When the squash is finished roasting, transfer several wedges directly from the pan to the top of each bowl. Finish each salad with a sprinkle of salt, pepper, and garlic powder, as well as a final drizzle of dressing. Serve immediately. * Feel free to use toasted walnuts, if you prefer, but rest assured that raw work wonderfully too! You can absolutely make this salad for a single portion too! 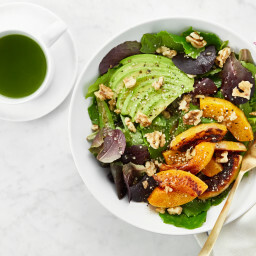 To build just one salad, I suggest portioning each ingredient as follows: approximately 2 handfuls of greens, 1/4 of a large avocado (sliced), 3/4 cup warm roasted squash, 1 to 2 tablespoons vinaigrette (to taste), 2 heaping tablespoons of chopped walnuts, and 1/2 tablespoon of hemp hearts. Any leftover squash can be easily reheated over the next few days. Here is how I like to warm up leftover roasted squash: Coat a large skillet with oil and add your leftover cooked squash with a pinch of salt. Sauté over medium-high heat for about 5 minutes, until warmed through. 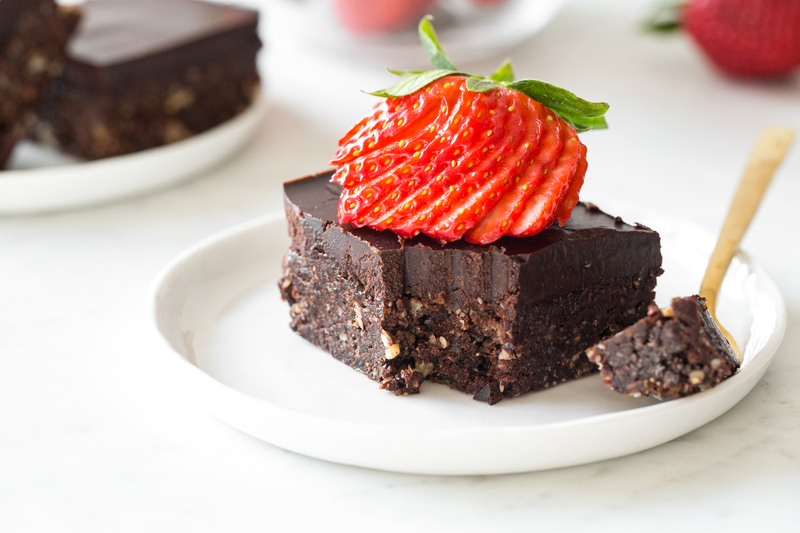 In case you missed it, I recently revamped my Two-Layer Raw Chocolate Brownies—just in time for Valentine’s Day! You can find the recipe on The OSG Recipe App (iOS/Android) and updated in the original blog post too. I can’t tell you how much I LOVE THESE BROWNIES….gahhhhh!! They would be a fantastic V-Day treat (and can be made ahead and stored in the fridge or freezer for easy prep!). Mmmm this looks so delicious! I truly love your recipes and always feel inspired. 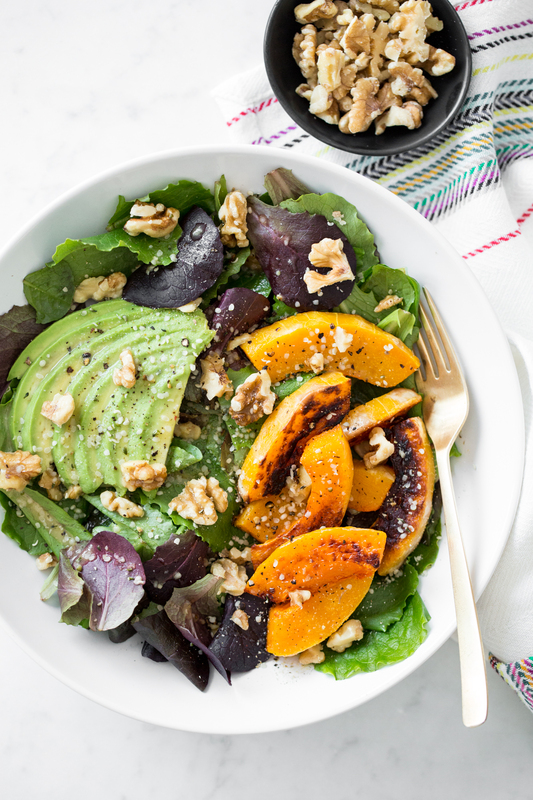 I happen to have some shredded red cabbage leftover and that would work well here I think to replace the squash :) Walnuts, avocado and dressing were my missing link! That sounds delicious Monique! And thanks for your kind words about my recipes. I’ve been eating a lot of squashes lately so this is perfect, especially since I want some new recipes for them, a salad even better, thank you for this recipe! Hey Sabrina, We can’t get enough of squash this winter too (well aside from Arlo, it’s one of the veggies he loathes…lol…the dramatic face he makes when he puts a piece in his mouth!). I hope you enjoy it! I love this idea! I have been making a very similar salad with roasted sweet potatoes and steamed broccoli, but I just added walnuts and hemp hearts and it was SO much better!! It’s the little things. :) Oh and I’ve been using vegan ranch mixed with buffalo sauce because of a weird pregnancy craving, but I’m definitely going to try this yummy dressing instead- sounds much healthier! Totally agree with you about the toppings taking these salads to the next level…I can’t get enough! That dressing sounds awesome too. I am new to the plant based diet. My interest was piqued several months ago and I am using Lent as my springboard into giving it a go. I ran across this recipe and decided to give it a go. Soooooo good! And gives me a small boost of confidence that I can do this! Thanks for the tip on how to reheat the butternut squash later on. Exactly the question I was thinking as I was done fixing this salad. Hey Georgie, Thank you so much for the feedback and recipe love. It makes me so happy to hear that this recipe boosted your confidence. You got this!! :) I’d love to hear what other recipes you try out. You had me at vegan and gluten-free. I make most of my recipes the same way! Thank you for this delicious salad to try. Love the avocado and butternut squash blend. So glad it was a hit! Come on spring…we’re ready for winter to wrap up too. lol. I absolutely love this salad! I have made it multiple times in the last couple of weeks… I add beets in with my squash and I roast all the garlic! It’s so fabulous! I love adding beets too…such a good addition! I’ll have to try it with roasted garlic. :) mmmm. Thanks for trying it out! I made this salad for friends this weekend and it was a huge hit! I swapped out the walnuts for pecans. This was so easy and incredibly yummy! The dressing even satisfied my sweet tooth and I didn’t crave dessert like usual. This will be a staple for me. Thank you! Happy Family Day! I like vitamin glow warm squash salad. Thanks this post! Oh my goodness I tried this recipe and it was amazing. I can’t say enough how much I love avocados. They pair well with toast with eggs and goat cheese my favourite morning snack. Changing my diet has been the most effective way for me to take on this lifestyle and live a healthier life for myself and my family. Due to my large family I ran across another article for families who want to eat healthy together. Hey Anne, Thank you so much for the recipe love! :) As for subbing banana, it can be done in some recipes, but it really depends on the recipe. If you have any specific ones you’d like to try out I would be happy to help troubleshoot with you! Just let me know. 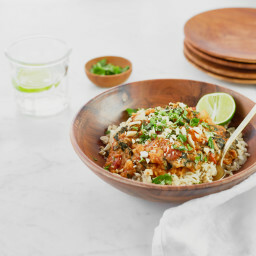 I have just discovered your fabulous website and your wonderful recipes, but I do have one question to ask which is: why you do not provide calorie valuations with your recipes. I fully understand that you do not want people to be obsessing over calories but nonetheless it would be great if these could be included alongside the portion information to give indications. I totally understand what you’re saying in regard to the nutritional info. It’s something I’m asked for fairly often so I will definitely consider it in the future. 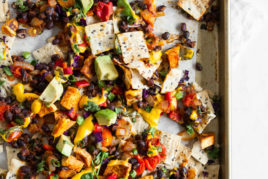 Thanks for sharing this recipe and this gives me a whole new idea of making my lunch healthy. This recipe does not even require me to cheat myself by substituting any heavy fatty items. The ingredients are absolutely fine for me and I substituted maple syrup with honey and it tasted really good. 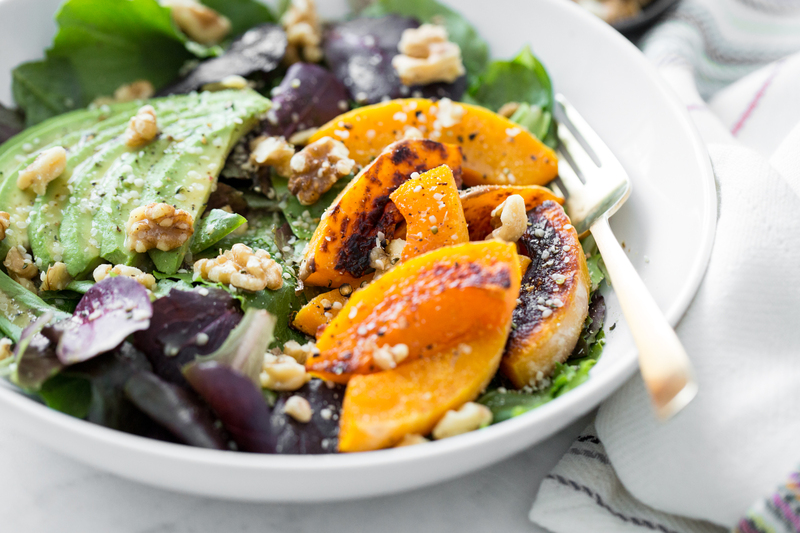 I am going to make this salad today but with a couple of changes, instead of butternut squash I am going to use grilled peaches and instead of grapeseed oil, olive oil (it is the lightest tasting oil to a Greek :) ). This is delicious! I am eating the leftovers for lunch, and the dressing got even better overnight. I used roasted sweet potatoes and acorn squash, and baby kale as the base. Will definitely be making this all winter! Hey Kristi, So glad you love it! Thanks so much for your feedback. :) Roasted sweet potatoes and acorn squash sound like a great combo. Previous post: Friday FAQs: Smoothie swaps, my go-to vitamins, and more! Next post: Ask Angela: 12 foods I eat every day, freezing cupcakes, and more!